Chaos reigns in Los Angeles after a mysterious event causes everyone in the world to lose consciousness at exactly the same moment. Was it an act of nature? Something man-made gone wrong, or something even more sinister? Whatever it was, every person on Earth blacks out for two minutes and seventeen seconds and sees a series of events on April 29, 2010 at 10:00 p.m., Pacific Time – exactly six months in their future. For some the future will be joyous and hopeful; for others, shockingly unexpected; and for a few, it simply doesn’t seem to exist.Knowing their fate will alter each person’s life in one way or another and poses the questions: Can destiny be changed? And by changing just one destiny, what effect would that have on those of others? Download FlashForward in Digital HD from the iTunes store. 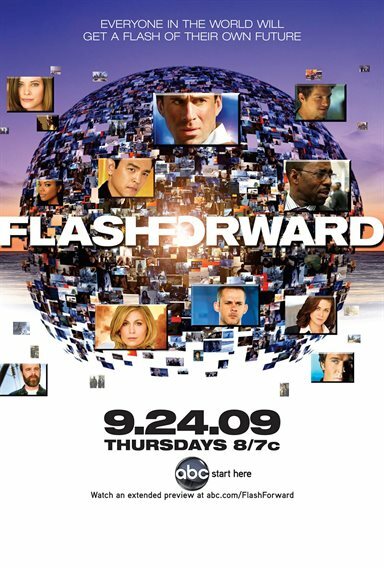 FlashForward images are © ABC Studios. All Rights Reserved. 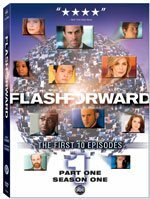 The concept behind FlashForward is that in the near future, on or around October, the whole world blacks out for exactly two minutes and seventeen seconds at 11:00 a.m. Pacific Daylight Savings Time. During the blackout, almost everyone envisions themselves at that time six months into the future -- April 29, 2010. When they awaken, 20 million people are dead; if you were driving, taking a bath, or swimming, you were in trouble; and the world has sudden knowledge that they didn't have before. 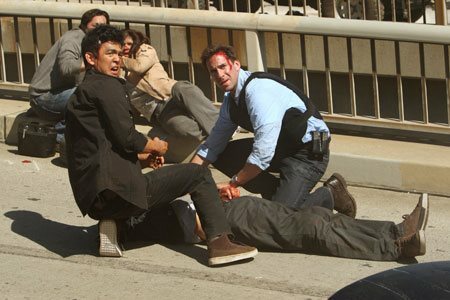 The show centers on an FBI team in LA that decides to investigate this because while in the future, one of the agents (Mark Benford, played by Joseph Fiennes) saw himself investigating it ... and about to get shot and killed by masked gunmen breaking in. As the show uncoils, there are potential scientific explanations: 1) Did someone's super-collider style experiment trigger it; and 2) Some revelations that this may have happened before at a smaller scale. It is also a soap opera. All of the principles had break-through realizations in their 2:17 minutes that turn their worlds upside down. Marriages are seen falling apart, the dead are seen alive, and hopes and dreams are seen dashed or fulfilled. As the amount of context coming from the short burst is highly limited, the survivors are left to guess what set of events lead to what they saw. Oh, and one more note: some people just see blackness. The going theory is that those people do not have a future; they are going to die in six months. 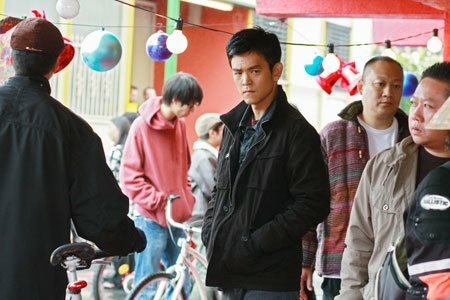 Falling into this category is fellow agent, Demetri Noh, played by John Cho. 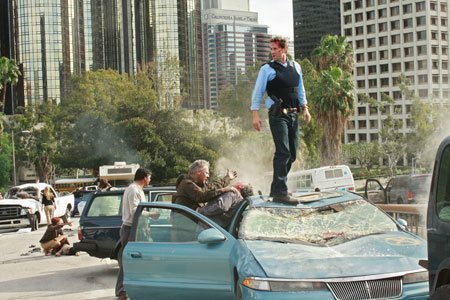 The show doesn't hinge on special effects, but their "end of the world" opening when the main characters get revived on an LA over-pass to see wide-scale destruction (massive traffic accidents as far as the eye can see) is unparalleled in my TV experience. We have learned, unfortunately, from 9/11 what a huge-scale disaster in the US looks and feels like, and Flash Forward gives us the echoes (including the wall of missing faces). It is effective and well done. That is the set up. Is it smart? Well done? The answer to both of these is "yes". Time travel shows are tricky, and the characters get it almost all right. There was a point where I was saying to myself, "you could do this", and then one of the characters did it. To be sure they don't get it all correct (the method of seeing if they could 'change the future' could have been tested by demolishing a building or something). Also, they do not hit some key notes (a character who sees a particular piece of jewelry in his vision doesn't take it off because it was given to him by his daughter ... I would have placed it on the other wrist immediately). However, the show isn't stupid about things; there is one big question: why does the future-vision not show everyone's reaction to it, such as staring at a set of notes set to explain everything -- even while the FBI is investigating 'the event' -- my conclusion is that what that future suffered as an event and what the current show suffered as the event are two different things ... but that is confusing, and I don't know if it's true. The pacing is good. The story for the most part clicks along, and while you can see the writers juggling action, detective work, and soap-opera, it all comes together fairly smoothly. Rather than give us "investigation of the week" structures with an overlaid main-story-arc, it seems more like a single continuous narrative; and I like that. It is sort of the artistic equivalent where a director tries to do un-cut camera work for an extended period of time; it isn't as easy as being more episodic. The pace of reveals is slow, but not Lost-slow and the show seems to firmly know where it is going, so the viewer won't feel jerked around. The acting is okay. Fiennes has to carry the show as a somewhat jealous recovering alcoholic husband, and I just found him a little unlikable and tiresome. It is also clear that rather than trying to "change his future", he plans to "play chicken" with it. The nervous chemistry between Noh and his wife, Zoey, feels real enough. If there is anything that didn't do it for me, it was that the event assumes that something life-changing was happening in that 137-second- time-span. If it happened to me, I would see myself sitting in front of a computer...or the TV...or something. Indeed, one character is on the toilet in a truth-in-TV moment, but for the most part, the main characters got really important stuff at 10:00 p.m. As, in my experience, very little of consequence happens at 10:00 p.m., so I have to wonder if there is something unrevealed behind this. I kind of doubt it. 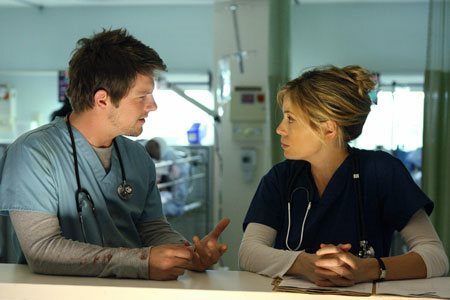 It is also true that we have only got the first half of the first season, so there is no conclusion here. It picks up again in March. The extras are thin; the making of the opening scene is good; otherwise there is not much to look at. If you want the whole thing, you will need to wait. Over all, I'm quite impressed. It is an entertaining science fiction show, and for me hits the right notes with its disaster theme. It didn't floor me, but it is a darn good watch; and I'm very curious to see what happens. 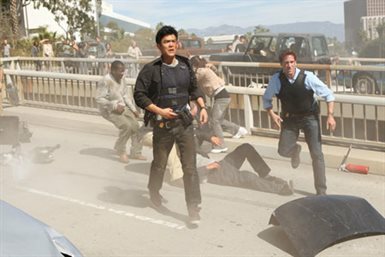 FlashForward images © ABC Studios. All Rights Reserved.